Curious about having your home painted or are unsure what kind of building materials can actually be painted? We’re here to provide you with some guidance. Most outdoor building materials are able to be painted, anywhere from brick to wood. If you’re unhappy with the existing color of your exterior, we can provide exterior painting services that match your preference. 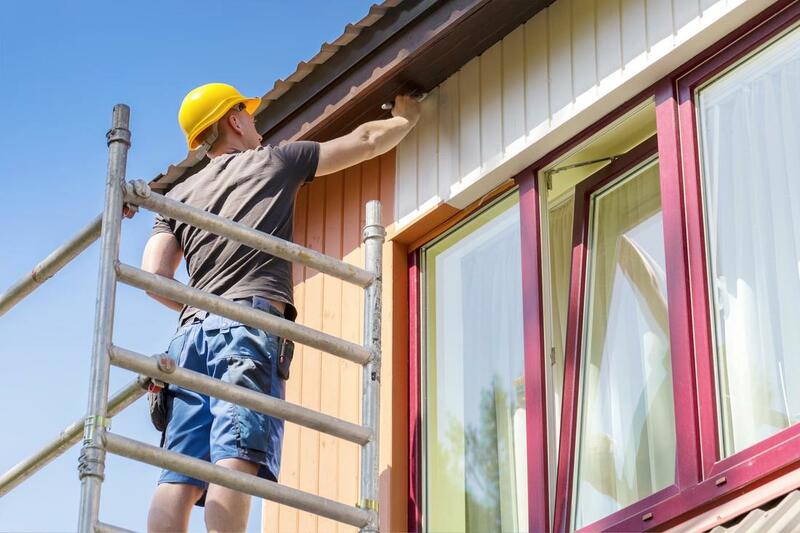 With exterior painting, it is always beneficial to enlist the help of professional painters to avoid potential injury. Without the adequate tools to lift you around the parts of your home and the right painting utensils to reach high areas, doing so on your own can be difficult. We arrive on site with everything in hand that’s needed to complete your exterior paint job in no time. We also use a variety of painting tools that help reach complicated areas and can perform painting techniques that provide complete coverage. Before beginning the exterior painting process, it is important to prepare the space you’re having painting. In doing so, we begin by power washing the exterior surface of your home to ensure that all dirt and debris is adequately removed. If you leave dirt and debris on the home and add a paint coat to it, you’ll likely end up with uneven paint that has added chunks or dirt in the layers. To avoid looking patchy or muddy, cleaning is very important and typically included in the painting process. Another needed step in the painting process is to prime the surface once it’s been cleaned. Primer is a paint-like substance that is added to the surface of the property’s exterior once it has dried. Primer helps to even out any imperfections and uneven tones in the surface and allows for the paint to stick better and for longer. Adding primer to your painting routine can prolong the paint’s longevity and ensure that it is less prone to flaking or chipping. Priming can also help bring out the brightness and depth of the paint color you’ve chosen. This is especially vital for colors that are more neutral and require the extra boost of enhancement. As the final step of the painting process, a sealing top coat is then added to the outer layer of the paint. This comes in a variety of finishes from satin to matte, depending on your preference. Sealing agents not only provide an aesthetic top coat for your paint, but many are engrained with protection properties that enhance the durability of your paint against the elements. Such sealing agents can include water, stain, and fire-resistant properties that deter any potential damage away from your property’s exterior. We always recommend adding a sealing agent to the outside of your property’s paint job, as this will lock the paint in place and ensure that it holds to the surface accordingly. Some sealing agents and top coats also have quick-dry properties that can speed up the drying process for your home’s exterior.